We all know that as life gets busy it can be really easy to skip a home-cooked meal. From Postmates to drive-throughs there are a million ways to get a quick bite. But you sacrifice so much when you take the easy way out. It costs way more money and usually is way worse for your health. So even as I’ve been swamped with projects of late, I’m staying committed to eating at home. How? Enter the one-bowl meal. A one-bowl meal is the perfect busy person solution. You just make sure your refrigerator (and pantry!) are crammed with ingredients, make sure your spice cabinet is stocked and you can reach in and whip up any one of these bowls for virtually any meal. They’re really all-day friendly. I recently made this delicious bowl that’s now on heavy rotation, but I’m also constantly pinning new ideas. The following 11 one-bowl meals are on the top of my must-make list for the rest of the month. I’m confident these will keep me and the fam well-fed until May. For all the avocado toast lovers out there, why not eat it in bowl form?! This salad combines some yummy bread chunks with avocado, but adds pickled shallots, toasted seeds and feta. Definitely next level. I’m all over it. The recipe is here. When in doubt, put an egg on it. That is my mantra when it comes to one-bowl meals. When it’s a Turkish egg drizzled in a spicy butter sauce I’m jumping for joy. This bowl is in the detox vein but gives you some full-fat goodness that will keep you satiated for hours. She’s real purdy too. The recipe is right here. Seeds toasted with Tumeric give this chickpea salad a hearty, Moroccan vibe. I’m into it. This recipe for overnight oats is one part breakfast, one part lunch. Yes, it’s foundation is oats – traditional breakfast fare, but the addition of miso-braised kale and scallions and furikake season takes it to a savory place that’s perfect for lunch. But then you also add a soft boiled egg so really, I think this dish is one of those any-meal types. Regardless its beautifully delicious and possibly want I’m going to make tonight! Deets are here. Bowl recipes typically include super ingredients and this one features a motherlode. Quinoa, kale, spinach avocado, almonds, coconut oil, sprouts and of course an egg. They call it a Green breakfast bowl, but this just might be what I’m having for dinner tonight! This salad recipe had me at halloumi cheese. Have you ever had it? It’s this kinda soft, kinda firm squicky greek cheese and I.love.it. Fried halloumi combined with lentils, cucumber, and some charred tomatoes sounds like the perfect combo to me. 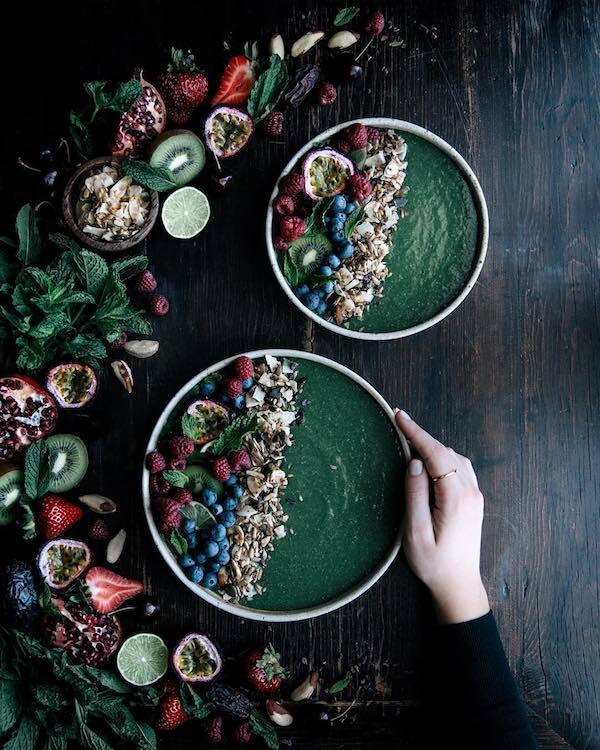 Smoothies are a no-brainer for breakfast, but if you want to take a little more time to slow down, set some intentions, or simply scroll Instagram for a few minutes, a smoothie bowl is a perfect solution. A smoothie bowl lets you add all kinds of favorite toppings. You’d be amazed how much more mindful you are when you actually have to chew. Check out this recipe from the Apt34 archives right here. I love any recipe that includes smoked salmon but when you add dukkah – my favorite spice blend du jour – things get really delicious. This is the perfect dinner salad idea. Hearty, flavorful and pretty too. Sweet spring carrots are now popping up everywhere. This lovely carrot ribbon salad with orange tahini dressing would be the perfect light lunch. Get the recipe here. Have you ever seen a prettier smoothie bowl? I love the idea of dressing up a green smoothie with toasted seeds, berries, kiwi and mint. I’m confident mine won’t look as gorgeous as Gather & Feast’s, but I’m ok with that. Chickpeas are a reoccurring star of these bowls, but it makes sense – they’re just so versatile. Packed with both fiber and protein chickpeas take on virtually any flavor profile you assign them. This Moroccan spiced chickpea bowl adds garlic, chili powder, cumin, turmeric and garam marsala for Moroccan flare. Cucumber and good greek yogurt counterbalance with some coolness. And the combo is just delicious. For even more easy healthy recipe ideas, CLICK HERE.